Supreme Court-appointed Environment Pollution Control Authority chairperson Bhure Lal said they were monitoring the situation. Delhi's air quality worsened further and slipped into 'severe' category Monday as heavy stagnant air prevented dispersion of pollutants, according to authorities. Supreme Court-appointed Environment Pollution Control Authority chairperson Bhure Lal said they were monitoring the situation and if severe conditions persist for 48 hours then stringent action, as prescribed under the Graded Response Action Plan, would be implemented. The Central Pollution Control Board or CPCB recorded an overall air quality index (AQI) of 412 which falls in the 'severe' category. Neighbouring Ghaziabad, Noida and Faridabad also recorded 'severe' air quality. Noida's air quality was the worst with an AQI of 452, the CPCB data showed. An AQI between 201 and 300 is considered 'poor', 301 and 400 'very poor' and 401 and 500 'severe'. Nineteen areas in Delhi recorded 'severe' air quality and ten areas recorded 'very poor' air quality, according to the CPCB. Stringent actions include emergency measures like odd-even car rationing scheme. A ban on construction activities would be automatically enforced in the city if PM 2.5 level breaches 300 micrograms per cubic metre and PM 10 level stays above 500 micrograms per cubic metre for two consecutive days. Under the 'severe' category, even healthy people find it harder to breathe and doctors advise physical activity to be kept at a minimum. Authorities said they are closely monitoring the situation. The overall PM2.5 level -- fine particulate matter in the air with a diameter of less than 2.5 micrometre -- was recorded at 257 and the PM10 level at 445, it said. 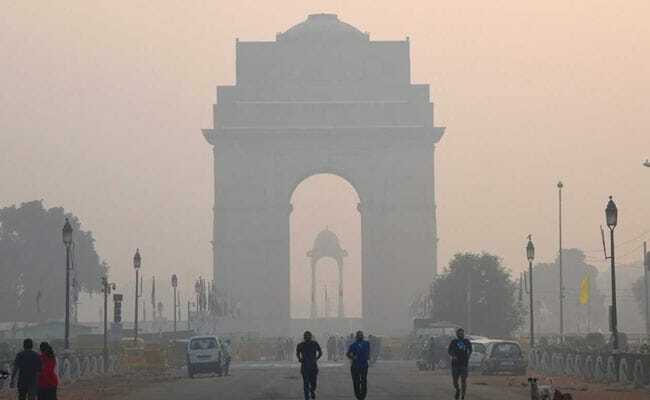 The Centre-run System of Air Quality and Weather Forecasting (SAFAR) said the overall air quality of Delhi will further deteriorate over the next two days. "Values are likely to remain in the same range until tomorrow which is likely to decline by Wednesday. Calm surface winds are not allowing pollutants to disperse," it said. "Winds are calm and dispersion is low. Western disturbances influence may impact Delhi's air quality by introducing the moisture and making air heavy. The expected fall in temperature and moderate fog is likely to increase pollution over coming two days and will keep the air quality in the upper level of very poor," the SAFAR said. The SAFAR said the air quality might improve Wednesday if sufficient amount of rainfall occurs which is expected. "However, marginal shower often deteriorates air quality because high moisture content overshadows the wash-out effect. In all probability, the AQI will remain within the limit of very poor and will not touch 'severe'," it said. "Levels of gaseous pollutants, NOx and CO are forecast to be enhanced, up to moderate range, after a long time due to a fall in boundary layer height and reduced vertical mixing," the SAFAR said. The EPCA chairperson said that if winds blow then the air quality might improve and hoped that the predicted rainfall might pull the air quality from severe category. He also conducted inspections at Bawana and Narela and said 45,000 tonnes of garbage was removed and one vacant land where garbage burning was taking place was found during inspection. "I will bring this point to the meeting before LG and vice chairperson of the DDA will also be there. This waste burning on vacant land was reported by people there and grievances of industrialists was also heard," he said, adding, he would conduct an inspection at Anand Vihar Tuesday.